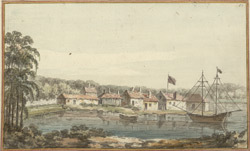 Watercolour of Oswegatchie on the St Lawrence River in North America. The Saint Lawrence River is 1900 miles in length and flows from Lake Ontario in Canada to the Gulf of Saint Lawrence which is the largest estuary in the world. It forms one of the longest waterways in the world and forms part of the border between Canada and America. The river was known as ‘Kaniatarowanenneh’, which translates as ‘big waterway’ by the native Americans. The first European to navigate the river was Jacques Cartier in 1534.